You’ve probably traveled somewhere and wished you could take a photo or video of the incredible scenery in front of you. But usually, whenever we do something rugged (i.e., hiking, going anywhere near water, etc.) we tend to be wary of carting around our expensive and delicate phones and/or cameras. 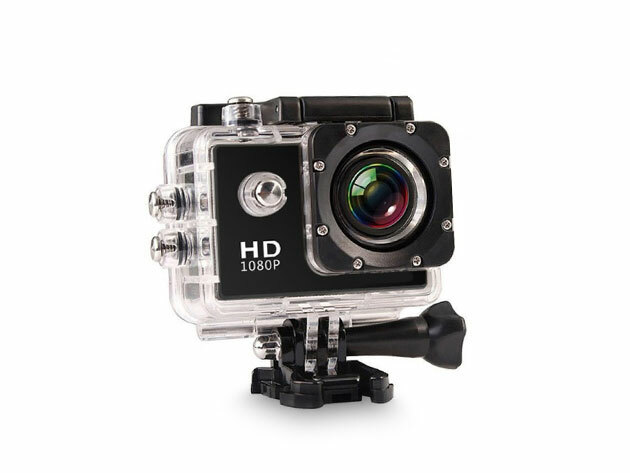 This All Pro HD Waterproof Action Camera + Accessory Pack is the perfect alternative — it’s durable enough that you won’t have to worry about taking it with you on even your most rough-and-tumble travels and still captures perfectly crisp video and photos. This camera lets you record HD content for up to three hours on a single charge, and you can take pictures or capture video in up to 30 feet of water — meaning you can take it with you when you go snorkeling, or take it with you to the next pool party you go to. The camera also features a 12 MP HD wide-angle lens that means you won’t miss a single detail, and it comes with an accessory kit so you can easily mount the camera to your helmet, bike or car. Take it with you for your next vacation, or even the next time you explore the great outdoors. Usually, this All Pro HD Waterproof Action Camera + Accessory Pack is $149.95, but you can get it here for $39.99. Plus, use coupon code SEMIANNUAL for an extra 15% off to bring the final price down to $33.99. Will a ruling due Tuesday lead to a U.S. sales ban on the Apple iPhone? Restaurant celebrates anniversary with free food!